Nine people were injured Wednesday when a Metro bus collided with a vehicle in the Westlake area. The crash occurred in the 1800 block of West Wilshire Boulevard at about 10:30 a.m.
Three people were treated at the scene and released. Six people were hospitalized in fair condition, said Matt Spence of the LA Fire Department. Investigators are attempting to determine what led to the crash. Forty people were aboard the Metro bus. The other vehicle, a shuttle bus, was not carrying passengers. Police said both drivers claimed to have a green light. Authorities said a forward-facing camera on the Metro bus might reveal more information about the crash. 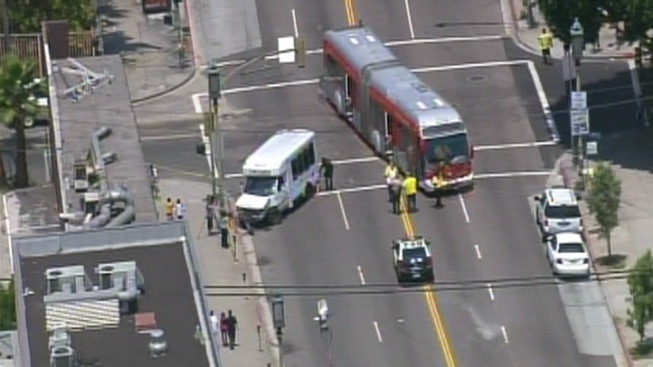 A Metro official said the bus was eastbound on Wilshire.